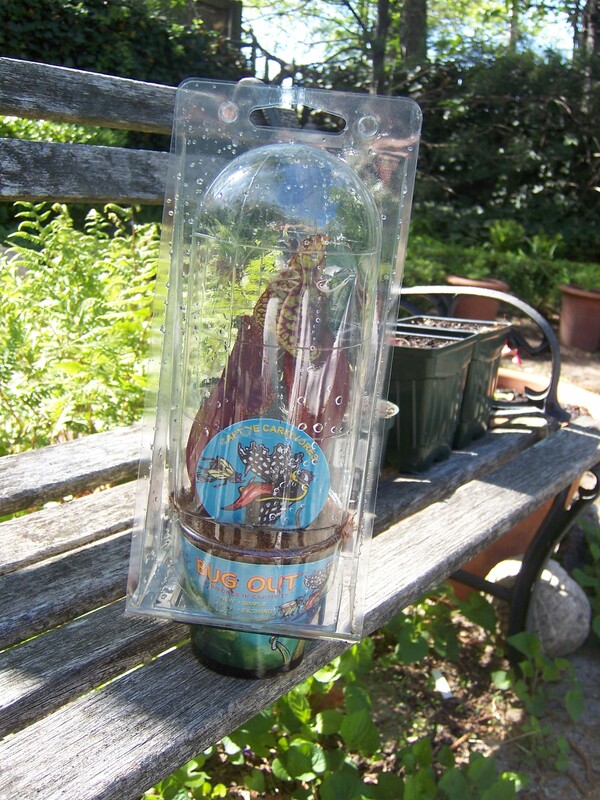 The other day, my friend Rachel presented me with a gift: a carnivorous plant. In my mind, carnivorous plants could only be found in two places: a primordial soupy rain forest swamp or a sci-fi film (think Little Shop of Horrors or The Day of the Triffids). In all honesty, it’s kind of cool to have a carnivorous plant in the yard. It’s also a little intimidating. Does this mean I have to barbecue steaks for me, Joe, and the plant? Eric Kunz is the man behind Wowflowers, Long Island’s largest supplier of carnivorous and unique water plants, as well as the only licensed grower of these endangered and protected species in all of New York State. He is passionate about his plants. According to Mr. Kunz, the plant I own is “Jersey Girl,” a type of Sarracenia purpurea, or purple pitcher plant. The plants are native to North America, and can be found living in bogs throughout New England and along the Canadian border. He also assures me that caring for these other worldly perennials is easy. For starters, the plants are sold in an environmentally friendly package, including the clear plastic container, which is recyclable. The plant itself comes in a cocoa fiber pot, which is biodegradable. 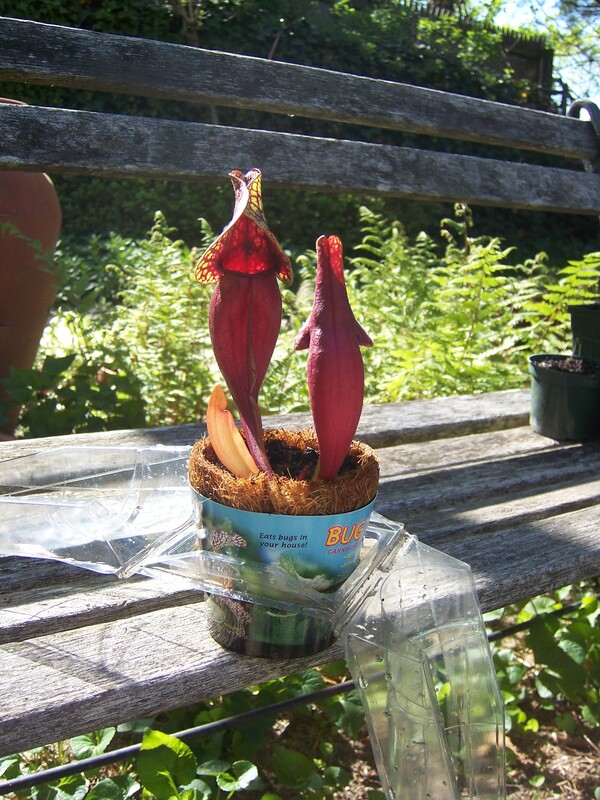 Upon receiving the plant, Mr. Kunz suggests replanting the Sarracenia (and the cocoa fiber pot) in a 6″ pot. Ideally, it should be a pot without drainage holes because bog plants love water. If your pot has drainage holes, you can line the pot with plastic and then replant. You may also want to drill a weep hole about 1″ from the top of the pot so excess water can run off, although Mr. Kunz says this is not necessary. Potting soil with sphagnum peat moss and without a time-released fertilizer is fine as a planting medium. The repotted plant should be placed in a sunny location — just remember to keep it watered, but not to the point that you’re drowning the plant. Keeping the pot in a tray of water helps to re-create the plant’s soggy boggy habitat and prevents the sticky substance inside the pitcher from washing away. About the only thing the plant is fussy about is the type of water used. Rainwater or distilled water is best; tap water is deadly because of the chlorine levels. As for fertilizer, don’t even think about it. All of the plant’s nutrients are gathered from the mosquitoes, gnats, and other bugs that become trapped in the pitcher and then digested. The larger tropical varieties can even handle small birds and rodents! (Note to self: keep an eye on the dog!) The plant will let you know that it’s full when it turns brown, according to Mr. Kunz, who also cautions that brown pitchers should not be cut back. After the growing season, the plant goes into its natural dormancy. Mr. Kunz says to keep the plant outside for the winter. Even if the soil freezes in the pot, this should not hurt the plant, since it would survive freezing conditions in its native habitat. Then, in the spring, the growing and eating process starts all over again. Currently, Mr. Kunz says that he is in the process of building a growing facility at Hobbs Farm, in Centereach, NY. Once completed, the public will be treated to educational displays and presentations. Until then, I’ll make sure to keep it watered and well-fed. That reminds me. It’s dinner time, and I should probably do the same for me and Joe. Hi, Lee. Nice to hear from you. This plant is a whole new realm for me. I’m looking forward to getting to know it. Iam new to this kind of plant, I bought it at the Parrot Expo a few days ago. I sent for a book at Amazon and trying to find out all that I can; I would like to find some club for these guys. I live in Central Islip, Long Island. Hi Olga. I’m not aware of any local organizations, but this website might be of help: http://www.carnivorousplants.org/howto/GrowingGuides/S_purpurea.php For mine, I lined a pot with plastic wrap to help the soil hold on to moisture. The plants usually grow in a swamp-like environment. Since I kept it outdoors, I let the plant fend for its own food supply. It also survived quite nicely outside all winter, even in a pot. Hope this helps and good luck with it. The vendor that was selling the carnivorous plants at the recent Parrot Expo in Freeport, NY was Eric of Seemore Gardens in St. James. I was also at the Expo and had a brief opportunity to meet him and hear about the various plants he has (it was a very busy day!). I also had a wonderful experience visiting him in St. James and having him explain in further detail about the plants and how he grows them. Very nice man who is enthusiastic about his plants and I encourage you to contact him if you have any questions or concerns. As Kevin posted, he also lines the pot with plastic to keep the water in the pot. One major piece of advice: do not water your plant with tap water! Only use rain water, distilled water or even water from a dehumidifier. The minerals in tap water are harmful to carnivorous plants. Hi Anne. Thanks for the info. I also heard about the distilled water — but I must admit, I relied mostly on rain water.